Chronic avulsions of the Achilles tendon from the calcaneus are infrequent.1,13,19,26 Achilles “sleeve” avulsions are a surgical challenge, as the Achilles tendon sleeves from its insertion into the calcaneus leaving virtually no tendinous tissue on the posterior calcaneus to facilitate a repair to the free end of the Achilles tendon.22 Therefore, reconstruction of chronic avulsions of the Achilles tendon can be technically difficult. Hence, can be necessary a tendon graft because may be not possible to directly reattach the Achilles tendon. 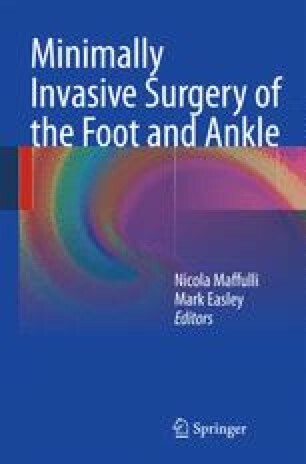 The free hamstrings tendon transfer and interference screw fixation for less invasive reconstruction of chronic avulsions of the Achilles tendon is a less invasive technique using a free semitendinosus tendon graft with interference screw fixation in the calcaneus through a Cincinnati incision. This approach permits a wide exposure of the insertion of the Achilles tendon, preserving the integrity of the skin overlying the site most decreasing the risk of wound breakdown.